Members of David Cameron's new cabinet have been banned from having their mobile phones and Blackberrys with them during meetings. The prime minister told them the rule at their first gathering on Thursday. There was laughter in the room when Mr Cameron had to call Justice Secretary Ken Clarke to attention, as he was still engaged in another conversation. Mr Cameron said he would continue the Labour tradition of holding cabinet meetings in different parts of the UK. The prime minister said the cabinet would normally meet every Tuesday morning at 0900 for "an hour or an hour and a half". The BBC News channel's chief political correspondent Laura Kuenssberg said he told members they could not have their mobile phones and Blackberrys with them during those meetings. He also said he thought the previous government's idea of holding meetings in different parts of the country was "a good thing, and I think we should try to continue that to recognise we're the government for the whole United Kingdom and it's an opportunity to get out and see it". The full team of junior ministers will be announced later on Thursday and Mr Cameron told his senior staff: "Everything you can do to welcome them and build strong teams in your department is obviously hugely important." Use of mobile phones and other devices during meetings and debates in parliament used to be banned, but now politicians are allowed to have them, but they must be in silent mode. 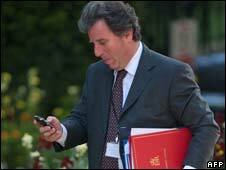 In 2008, then Commons Speaker Michael Martin rejected a plea from MP Greg Mulholland to fine colleagues if their mobile phones rang in the chamber. He made the call after a fellow MP's phone rang twice while then Culture Secretary Andy Burnham was answering questions in the Commons, but Mr Martin said he was "powerless" to implement the idea, even if the fines went to charity.